One tablespoon provides the nutritional equivalent of 3 servings of green vegetables or dark green leafy salads. Grown without pesticides or herbicides. Harvested at the peak nutritional level of the young plant's growth. Nitrogen-packed in glass bottles to remove corrosive oxygen. Plants as food are essential to the health and life of our bodies. All edible plants contain nutrients that can heal, strengthen, and protect our bodies. all which help to protect us from illnesses and disease. Scientific research has discovered that chlorophyll, the green-colored matter in plants, has almost the same molecular structure as hemoglobin in human blood. Chlorophyll, the "blood" of plants, helps build healthy blood in humans by supplying oxygen, nutrients, and phytochemicals (compounds in plants that protect our body against cancer and other diseases). 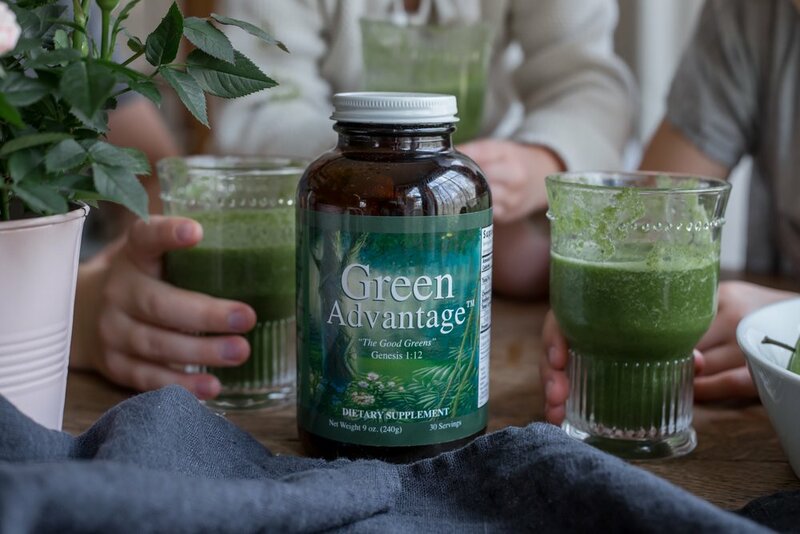 Green Advantage contains the most nutrient rich green plants available. It supplies essential vitamins and minerals in a form that is easily absorbed on a cellular level in the body. Contains no added yeast, sugars, salt, egg, fats, flavors, gluten, dairy products, or preservatives. Through photosynthesis, plants convert sunshine into chemical energy. Photosynthesis is the process by which plant cells make carbohydrates from carbon dioxide and water in the presence of chlorophyll and sunlight. Some scientists believe that photosynthesis is the most important chemical reaction in nature, because man depends upon plants to gather sun's energy and make it available to us as food. A plant only uses about 1/6 of the sun's energy to sustain itself, and the remaining 5/6 is stored in chemical bonds, ready for human metabolism to break it down into useful energy. Green plants make it possible for us to EAT the sun's energy! Solar energy captured and stored by plants as carbohydrates is the body’s first choice of food for the energy requirements of all brain and other organ functions.